Lupus - catch, body, contagious, causes, What Is Lupus? Lupus (LOO-pus) is a chronic (long-lasting) disease that causes inflammation of connective tissue, the material that holds in place the various structures of the body. "Oh, not again!" shouted 18-year-old Julia, her toothbrush falling into the sink with a clatter. It was the fifth morning this week that it had slipped from her hands. She had been waking up with achy, puffy hands, and she was finding it hard to grip things with her stiff fingers. A few weeks later, when filling out a form for a back-to-school physical, she wrote about her stiff hands and also mentioned that she had been feeling really tired all summer. Her doctor suggested she get some blood tests and called Julia's mother a few days later with a referral to a rheumatologist * . He suspected that Julia had lupus. Lupus causes inflammation of connective tissues in the body. Connective tissue is the material that holds the various structures of the body in place. The cause or causes of lupus are uncertain. However, it is believed to be an autoimmune disorder, which is a reaction of the immune system against one's own body. The medical name for lupus is lupus erythematosus (er-i-thee-ma-TO-sus). There are two main types of lupus. These are discoid lupus erythematosus (DLE), which mostly causes reddened patches on the skin, and systemic lupus erythematosus (SLE), which affects the skin but also involves other tissues and organs. A third condition, called lupus vulgaris, is unrelated to lupus erythematosus. It is a rare form of tuberculosis that typically produces nodules, or small lumps, on the skin. Lupus is a disorder that occurs in people of all ages worldwide. In the United States, it has been estimated that there are half a million lupus patients, or about one person in every 600. * rheumatologist (rooma-TOL-o-jist) is a doctor who specializes in disorders involving the connective tissue structures of the body. Although members of both sexes can get lupus, the great majority of people affected by the disease are women (at least 9 out of 10 in the case of SLE, and approximately 7 out of 10 in the case of DLE). The majority of women affected are young to middle-aged. Like Julia, about half of SLE patients show their first signs of the disorder between the ages of 15 and 25. In the United States, lupus is about three times more prevalent in people of African ancestry than in people of European ancestry. It also appears to be more prevalent in people of American Indian and Asian origin. Lupus is not a contagious disease. One person cannot catch it from another, and there is no need to avoid being near someone who has lupus. In about 10 percent of cases, certain prescription drugs, such as those used for irregular heart-beat or high blood pressure, can cause symptoms of SLE. (The symptoms usually go away when the drugs are discontinued.) This effect is noted most often in elderly patients and is referred to as drug-induced lupus. In the other 90 percent of SLE cases and in all instances of DLE, the cause or causes of the disorder are not known with certainty. Although most people who have studied lupus agree that it is an autoimmune disorder, this knowledge provides only a part of the explanation of its cause. The reason is that the causes of immune disorders are not themselves very well understood. There are, however, some things that doctors believe can play a role in the development of lupus. Heredity is assumed to play a part, although it is not known exactly what its role is. It has been determined that a person with a close relative who has SLE is slightly more likely to develop the disease (by about 10 percent) than someone who does not. The likelihood increases if one has an identical twin with SLE. Its higher prevalence in some racial groups also suggests that heredity plays a role. However, no gene (hereditary factor) has been specifically linked to the development of lupus. The fact that women are much more likely to get lupus than men suggests that hormones also may be associated with the disorder. Certain environmental influences are believed to play a part in the onset of lupus. It is believed that autoimmune responses in some individuals may be triggered by bacteria, viruses, extreme stress, sunlight, certain antibiotics, or food additives. But not everyone gets lupus because they caught a particular virus or bacteria, are stressed about something in their lives, took a certain antibiotic, or ate a certain food. The antibodies involved in the autoimmune response are called "autoantibodies." They are thought to react specifically with certain chemical constituents of the cells in the body, producing inflammation and damage to organs and tissues. The signs and symptoms of lupus vary greatly in different individuals, both in the parts of the body involved and the degree of severity. The symptoms may also come and go, and may go away for weeks or months. Although lupus occurs much more frequently in women than in men, the symptoms in males are no less severe than in females. The mildest and most common form of lupus, DLE usually involves only the skin. It produces a rash of thickened, scaly reddish patches on the face and sometimes other parts of the body. Often the rash spreads in a characteristic butterfly-shaped pattern over the cheeks and bridge of the nose. After a few weeks or months, when healing has taken place, dark-colored or pale scars may remain. If the condition extends to the scalp, the person may lose some of his or her hair. Sunlight tends to trigger and worsen the rash of lupus. In DLE, the patches sometimes nearly disappear during the winter months. Most people who have DLE are otherwise in good health. The condition only rarely progresses to SLE. People with SLE may have the same type of rash as those with DLE, and they may lose hair as well. In SLE, however, the skin lesions may spread and cause damage to the mucous membranes and other tissues. 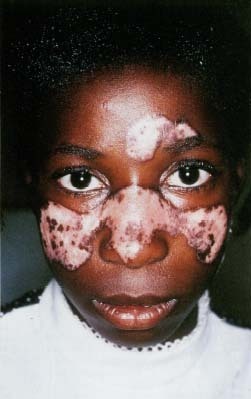 In some SLE patients the skin is not affected. Arthritis may be the first symptom in some people with SLE. In fact, SLE is medically classified in the same family of diseases as rheumatoid arthritis, a disorder that causes painful inflammation in the joints. Other early symptoms may include weakness, extreme fatigue, fever, sensitivity to sunlight, and loss of weight. Internal organs also may be affected by SLE, often causing serious disorders. Problems with kidney function are common in SLE patients, and uremia (yoo-REE-me-a), or the buildup of toxic substances in the blood due to kidney failure, can be fatal. The nervous system may be affected, causing psychological problems, seizures, or other symptoms. The lungs, heart, liver, and blood cells may also be involved. In the blood, the presence of certain antibodies called anti-phospholipid (AN-ti-fos-fo-LIP-id) antibodies interferes with the normal function of the blood vessels, and can bring on a stroke or heart attack. In pregnant women, the presence of these antibodies can cause a miscarriage. The name "lupus erythematosus" comes from lupus, which is Latin for "wolf," and "erythema," which refers to reddened skin. In the past, people thought that patients with the facial rash looked as though they had been bitten or scratched by a wolf. The large majority of lupus patients are women. There is no one symptom or test that means someone has lupus. Many lupus patients develop arthritis. Many people with lupus have to stay out of the sun. Most lupus patients can lead nearly normal lives. Lupus can be hard to diagnose, especially if there are just a few symptoms. There is no one sign or symptom that definitely means someone has lupus, and there is no single laboratory test that will diagnose it either. For this reason, a combination of observations and tests is always necessary. Diagnostic tests for SLE include blood tests for certain antibodies that attack the nucleus of cells, and for LE cells. LE (lupus erythematosus) cells are white blood cells that destroy other blood cells and are an indication of lupus. Sometimes a skin biopsy (removal of a small sample) is performed to examine for antibodies active in lupus. Early diagnosis is important so that treatment can be started as soon as possible. Various types of treatment may be chosen depending upon the particular needs and symptoms of lupus patients. A variety of drugs are prescribed to counteract pain, inflammation, and related problems. NSAIDs (nonsteroidal anti-inflammatory drugs), such as aspirin, ibuprofen, and naproxen, are used to lessen pain and inflammation in the joints and muscles. Another group of medications, called cortico-steroids (kor-ti-ko-STEER-oids), is prescribed to reduce inflammation and activity of the immune system. A third group, called anti-malarials because they also are used to treat malaria, is often prescribed for skin and joint symptoms. Skin eruptions are treated with ointments and creams that contain corticosteroids and sunscreens. Drugs prescribed to treat lupus can often cause unwanted side effects. For this reason, and because symptoms may change, ongoing medical advice with regular checkups is needed. There is no cure for lupus, but effective treatment can maintain normal body function and control symptoms in the great majority of patients. Nonetheless, SLE can be a life-threatening disease, particularly when the kidneys are involved. The most common causes of death are kidney failure, bacterial infection, and heart failure. There is no specific preventive measure, like vaccination, that one can take to keep from getting lupus. If one is diagnosed with lupus, however, there are ways to reduce the likelihood of "flares," or sudden worsening of symptoms. Patients who are sensitive to sunlight can help prevent rashes by avoiding excessive exposure to the sun, using sunscreens, or wearing broad-brimmed hats. Although there is no vaccination for lupus itself, immunization against other infections is recommended. Nearly everyone is familiar with allergies such as hay fever and asthma, either in their own experience or that of friends or family. An autoimmune disorder might best be understood as a kind of allergy, except that the immune system attacks parts of one's own body instead of outside substances such as dust and pollen. The normal function of the immune system is to protect the body from invading microorganisms or toxic substances. In order to perform this function, it produces antibodies and special white blood cells (lymphocytes) that will recognize and destroy the intruders. In autoimmune disorders, these responses (for reasons that are as yet not fully understood) occur against the body's own cells, tissues, and organs. This reaction can produce a number of illnesses, including rheumatoid arthritis, a type of diabetes, and lupus. Lifestyle changes can help patients with lupus avoid or control symptoms as well. Regular exercise can prevent some muscle weakness and fatigue. Smoking and excessive alcohol intake can be harmful, as they are to anyone. Changing such negative habits can bring about general improvement in one's health. Joining support groups and talking with family, friends, and physicians can ease the effects of stress. Lahita, Robert G., and Robert H. Phillips. Lupus: Everything You Need to Know. Garden City, NY: Avery Publishing Group, 1998. A nontechni-cal guide written in a question-and-answer format. Blau, Sheldon Paul, and Dodi Schultz. Living with Lupus: All the Knowledge You Need to Help Yourself Reading, MA: Perseus Books, 1993. A comprehensive guide to coping with lupus medically and in daily life. The National Institutes of Health posts information about lupus on its website. Further information may be obtained from the website of the Lupus Foundation of America. Do you know when lupus was discovered or who discovered it and how and how long it has been researched I am doing a project and those are questions I need to know! A couple days ago i was watching Americas Next top model and one of the ladys in the competition has lupus and i didnt really know what it was until i went on google and foun this website. I wanted to say thak you for the imformation your site has informed me of.